It's April here in Central Virginia and our mourning doves are cooing, which means nesting season has begun. The cooing claims territory and begins the process of raising more doves. Mourning doves are in the same family as pigeons but are slimmer with a soft grayish-brown body with a gray patch on the head. The black dots on the wings and single black spot below the eye are identifying marks. When they take off in a loud clapping of wings flight, you can also see the white-edged tail that is very conspicuous. The nests are built of twigs, weeds, grass and pine needles at a height of 5-25 feet. Some build in the corner of a porch. The ones I've seen you can see through the bottom and they make me very nervous since eggs have been known to drop out if the mama dove flies off suddenly from being startled. For this reason dove nests are best left alone or viewed with binoculars from a distance. 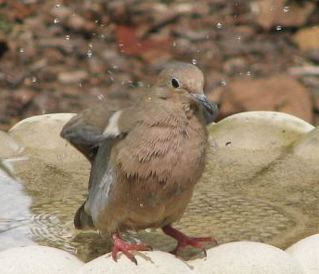 Abandonment of the nest with eggs or nestlings is common with doves if they sense any threat from human or animal. Generally two eggs are laid and incubated for two weeks. The young will be fed for about another two weeks before fledging. The babies are fed what's called 'pigeon milk' although it's not a milk. It produced by the glands in the crop of the parent bird. The nestling sticks its head inside the wide open mouth to feed on this food.Since they begin early in Spring, they will raise 2-3 broods and reuse the same nest for all of them. You can provide a safer and more sturdy nesting area by placing a nesting shelf in a tree or under the eaves of your house, but be sure to place it where they will not have to deal with any human or animal traffic flow nearby. If you'd like to supply food, preferences include cracked corn, proso millet, sunflower seeds and even chopped peanuts. We enjoy seeing the doves in our yard. They mate for life and seeing them wander about gathering a meal of seeds from the ground is a delight. They seem to so enjoy each other and the cooing is like a romantic lullaby to my ears.